For anyone with experience of Aura component development, they’ve probably faced the issue of how to test the damned things! They were so heavily tied to the platform that they couldn’t easily be tested in isolation. 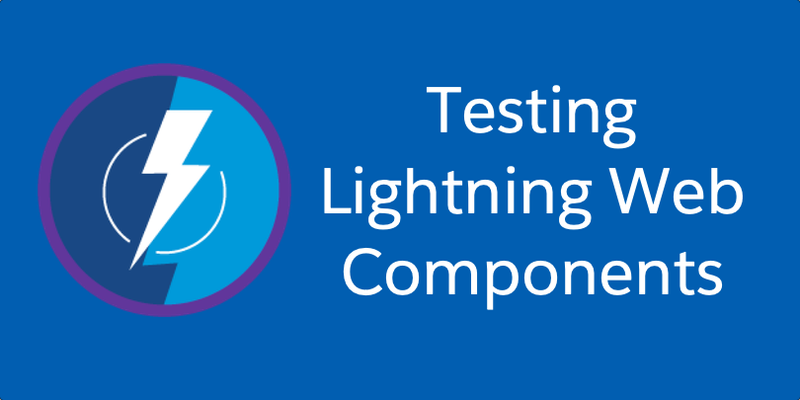 Fortunately Lightning Web Components has true TDD built in from the outset. It’s super simple to write tests and make assertions. Even better, if you’re used to writing tests with Jasmine, Mocha or Jest then you’ll be right at home. If you don’t yet have an LWC project I’d suggest following my previous post. In this post we’ll take what we did in that project and evolve to add some simple unit tests that we can run right from the command line on your computer… no need to upload code to the org! This will install Jest (a popular testing framework from Facebook used heavily on React) and Salesforce LWC Jest integrations, including the compiler and engine. Now open your package.json and under the "scripts" object add a "test:unit" property who’s value is simply "jest". As you can see we don’t have any tests yet, so let’s go add one. This will install everything we installed last time but behind a lwc-jest wrapper command. You can safely delete references to @lwc/jest-preset @lwc/module-resolver @lwc/compiler @lwc/engine in your package.json. Now when you run npm run test:unit it will run the lwc-jest cli command which in turn will call jest with everything installed and configured for you! These first 2 lines import the createElement function from the lwc framework. This is the magic which knows how to take an LWC class and turn it into an HTML Element. We’ll use this further down. The second line is how we import our component that we want to test. The c/ prefix is simply the namespace of it – in Salesforce orgs the default namespace is usually c.
Next we add our first describe, this is essentially the wrapper around where our tests live. We also add an afterEach hook. The code here will be run after every test and as stated in the comment it basically resets the DOM. In other words, it will remove any LWC elements we rendered after each test so that the next test has a clean slate. Finally our test! We use the createElement from the lwc import earlier to turn our HelloComponent into a real DOM element. Then we insert it into the body of our page. And finally we run our assertion – in this case I expect that there should be a <p> tag whose text content is Hello, World. If you re-run npm run test:unit you’ll get a nice happy test! Oh man! It fails!!! How can moving one line break a test? The difference between the two versions of this test are that in the first version of the test we set the value of person before we inserted the element into the DOM, therefore when the element is inserted it has the value of Matt and renders it immediately. In the second version we set the value of person after the element has been inserted. This means that the component needs to be re-rendered in order to update the DOM… and rendering is asynchronous. So when we do our expectation immediately after setting the new value, the DOM hasn’t been re-rendered and so we still see Hello, World!. All the code from this post is available as a github project for you to clone and run.